The undergraduate scholarship intends to benefit Malaysian students from low-income families, the Foundation believes that providing scholarships is about providing opportunities – giving a chance for students to have the higher education necessary to come into their own and be the next generation of leaders and captains of industries. Undergraduate studies in Public Universities: RM 8,500/= p.a. Diploma/Advanced Diploma courses in Public Universities: RM 6,000/= p.a. Undergraduate studies at local private universities: up to RM 24,000/= p.a. 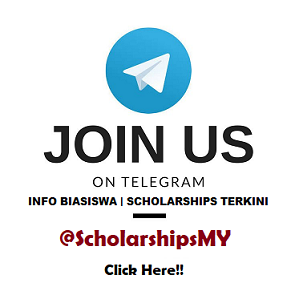 The scholarship is awarded for ANY course or field of study as long as it is a full-time Undergraduate Studies (1st degree course) or Diploma Course at recognised public and private universities and colleges in Malaysia. Those pursuing STPM, A-Levels, Matriculation, Foundation, Pre-U, and equivalent courses are not eligible.